ItemBARK_1990.0003.1068 - "New Canadians" on the Quesnel Courthouse steps after casting their first votes in a Cariboo by-election, back row, left to right: Anne Hoy, Rose Hoy, C. D. Hoy and Chas. Keen. Front row, left to right: Yvonne Hoy, Lona Hoy and Mrs. Chas. Keen; 1948. Item BARK_1990.0003.1068 - "New Canadians" on the Quesnel Courthouse steps after casting their first votes in a Cariboo by-election, back row, left to right: Anne Hoy, Rose Hoy, C. D. Hoy and Chas. Keen. Front row, left to right: Yvonne Hoy, Lona Hoy and Mrs. Chas. Keen; 1948. 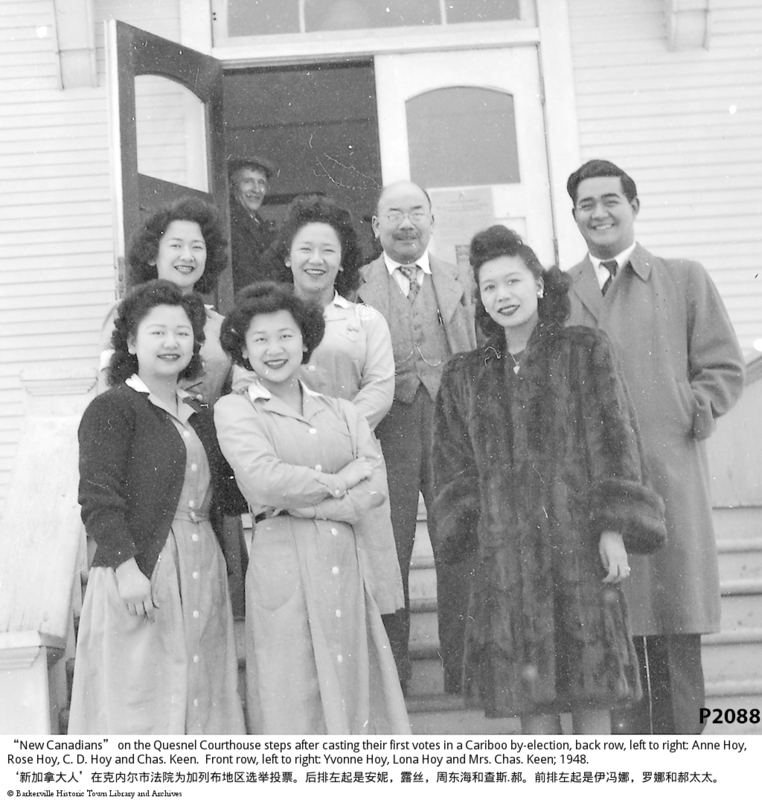 Five Chinese women and two Chinese men standing on the steps of the Quesnel Court House. Four of the women could possibly be C. D. Hoy's daughters and C. D. Hoy is standing at the back. See also P 2087, P 2089, P 2090. The other genlteman is either Charles or Harry Keen.